In my younger days, I dabbled in baseball card collecting and focused primarily on cards from the 1950s and 60s. Being a lifelong Dodgers fan, I sought out specific cards from “my” team. I was myopic with the cards that I pursued. This hyper focus was in direct alignment with my limited budget as I had to take into account that the cards of my favorite ballplayers were also some of the most valuable and sought after by collectors. For example, I couldn’t attempt to acquire an entire 1956 Topps set, opting instead to pursue the 1956 Topps cards of the Brooklyn Dodgers (which included Hall of Famers, Sandy Koufax, Duke Snider, Pee Wee Reese, Jackie Robinson and Roy Campanella). Over those years, I pieced together “team sets” from 1955 and 1956 of my beloved Bums from Brooklyn landing some very nice examples (though none have been graded) of the likes of Roy Campanella, Jackie Robinson, “The Duke” and many more. Acquiring Sandy Kofax and Don Drysdale rookie cards we crowning achievements from those days. My interest in the cards tapered off and I put it all away when I realized that the money I invested would not yield a return should I decide to divest it. I also started a family which further reduced my disposable income. I moved away from collecting all together. Years later, I received two groups of military treasures that belonged to my grandfather and grand uncle, sparking an interest in researching and learning about military history and my family connection to history. My interest in military baseball was piqued when I received my paternal grandmother’s photo album from the 1930s and saw the images of her little brother in his navy ship’s baseball uniform, posed for team photographs. I was reminded of my own participation with my ship’s baseball (and football) teams when I served in the Navy. I was hooked but only did I slowly begin to research America’s Pastime and how it is intertwined with the military. When I was contacted by Gary Bedingfield regarding research that he was conducting for his (then) book project (that would become Baseball’s Dead of World War II: A Roster of Professional Players Who Died in Service) as he searched for a sailor who was lost in the Battle of Savo Island, August 8-9, 1942. I was fascinated by his amazing online resource, Baseball in Wartime that primarily focused on professional ball players who traded their spikes for combat boots to fight for our nation. I was able to complete his research, locating Ensign Norman K. Smith who was killed in action aboard the USS Quincy (CA-39). Through spending time immersed in Gary’s site, I noted several of my favorite players who also served in uniform. I was hooked! 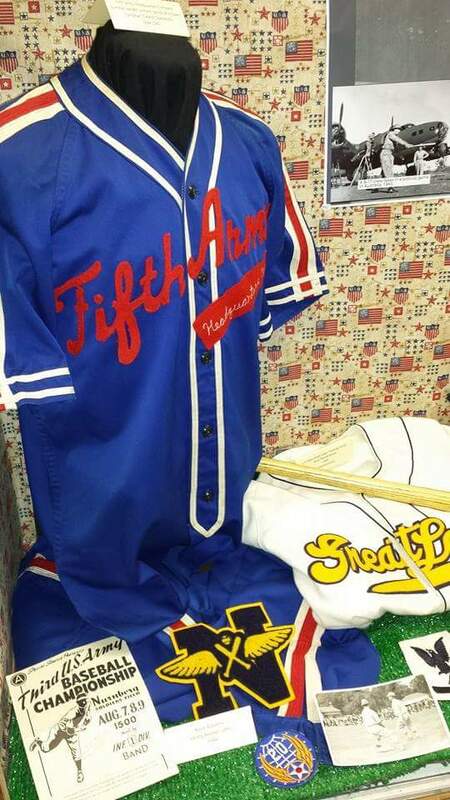 The road gray Marines baseball jersey in the back of this display was my very first item that I purchased for this collection. 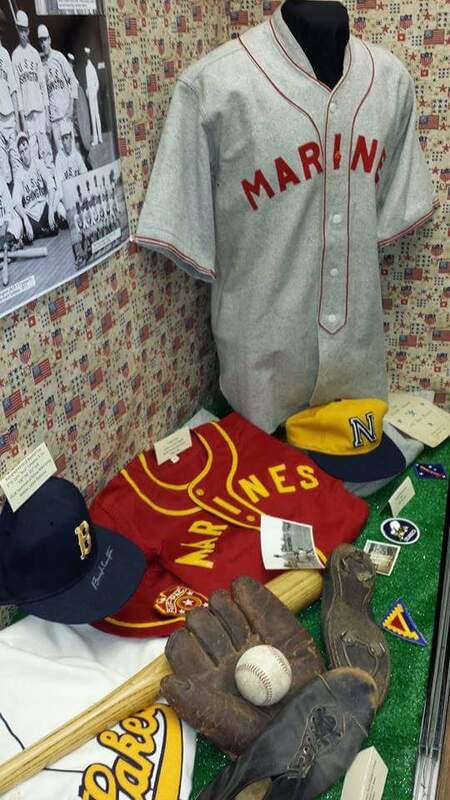 My entrance into military baseball collecting was through a purchase of a 1943-44 US Marines road gray wool flannel baseball uniform (jersey and trousers) that was in immaculate, yet game-worn condition. 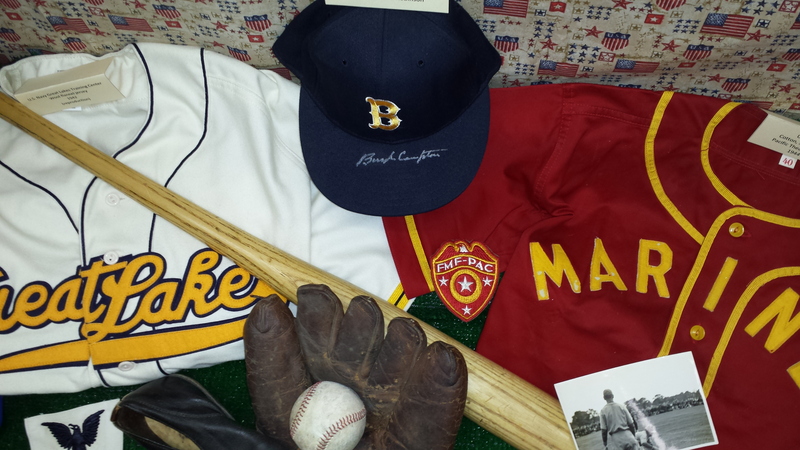 My interest expanded from there as I began gathering vintage photos, scorecards or anything that is associated with men who played ball during their serving this country, dating back to the early years of the 20th Century. Years later, my collection has grown to the point where I was asked to share it with the general public, displaying it my state’s largest fair (which is also ranked in the top 10 largest in the nation) with the potential of as many as 1.4 million visitors viewing this unique baseball collection. The mitt is a U.S. Navy stamped glove from WWII. The ball cap is a 1980s vintage UCLA team cap that was signed by Bruins HoF catcher, LT. Lynn “Buck” Compton (Co. E, 506th PIR, 101st A/B). Shown here as part of a public display in 2015, are the 5th Army HQ jersey and trousers.